Either this is bad, or there is something else correlated with it that is bad. Either this is bad, or there is something else bad correlated with it that is not completely predictable from the other variables in the regression. 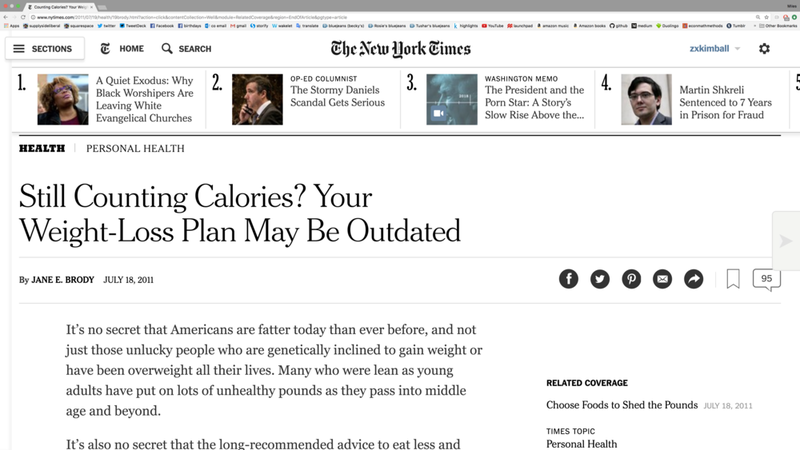 This statistical point is directly relevant to the results of the Nurses’ Health Study, Nurses’ Health Study II and the Health Professionals Follow-up Study analyzed by Dariush Mozaffarian, Tao Hao, Eric B. Rimm, Walter C. Willett, and Frank B. Hu in their 2011 New England Journal of Medicine article "Changes in Diet and Lifestyle and Long-Term Weight Gain in Women and Men." Below are some of the results, as reported by Jane Brody in a 2011 New York Times article. All the quotations below are from her article. That is, whatever made people gain weight before the period of time a statistical analyses focused on what likely to make them keep gaining weight, and controlling for the factors the study had data doesn't account for all the factors that made people gain weight in the past and are likely to keep making them gain weight in the future. There is an important lesson in this: if you are gaining weight, you need to do something different than you have been doing. This is a lesson that can be applied to our nation as a whole (and almost all nations): average levels of obesity are rising, so we need to do something different than we have been doing! Stop for a moment and try to describe for yourself what the approach to weight-control has been for the last few decades and clearly label that in your mind as something that is not working. This is an interesting list to compare to the insulin index of various kinds of food and drink that I discuss in "Forget Calorie Counting; It's the Insulin Index, Stupid." Let's see if the results in the table above that couldn't be predicted from the insulin index sound like they point to omitted variables. Here are two categories: worse than expected based on the insulin index and better than expected. In both cases, let me frame things as what the omitted variables would have to be like to make the results no mystery. Think now of the type of people who eat red meat, processed meats and butter compared to the types of people who eat yogurt and fruit and drink skim milk. Even after controlling for variables that were in the analysis, people eating yogurt (even sugary yogurt), fruit and drinking skim milk could easily be doing something else right. And people eating red meat, processed meat and butter could easily be doing something else wrong. This is more likely to be true because all the variables in the analysis are measured imperfectly, so each variable in the analysis only partially controls for the thing it is supposed to measure. On average, beer drinkers just aren't the same types of people as people who drink wine! Beer does have a higher insulin index than wine, but they are both quite low on the insulin index. So drinking wine should be better judging from the insulin index alone, but I suspect the size of the extra weight gain for beer drinkers has a lot to do with omitted variables. By and large, the results of this analysis of data from the Nurses' Health Study and its sister studies jive quite well with the recommendations I give in "Forget Calorie Counting; It's the Insulin Index, Stupid." And where they don't, it is easy to see possible omitted variables. Recommendations where there were surprises relative to the insulin index: There is no harm in keeping one's meat consumption low. Indeed, because meat is at a middling level on the insulin index rather than a low level, I recommend eating meat sparingly in "Why a Low-Insulin-Index Diet Isn't Exactly a 'Lowcarb' Diet." The analysis described here has skim milk and whole milk as equal, while the insulin index suggests skim milk is worse. That, plus the fact that whole milk tastes a lot better suggests that you should stick with whole milk if you drink milk at all. Whole fruit has many good nutrients, so I have always recommended eating more of it than the insulin index alone would suggest. Plain, full-fat, unsweetened yogurt is a great thing to eat anyway, if you are OK with dairy. Thus, in my recommendations, the one place I depart most from what this analysis of Nurses' Health Study and its sister surveys is that treat butter as healthy. I may be wrong, but my actions are based on that view. Here is one way I might be totally right. Bread is very high on the insulin index. People who eat butter are likely to eat more bread. And that is unlikely to be fully captured by the the imperfect measure of bread-eating in the study. Importantly, in our society, it is not socially acceptable to eat butter straight. So butter eating is highly correlated with eating other things, many of which are quite unhealthy. If half the population ate butter straight while the other half didn't eat butter at all, the estimated predictive power of butter for weight-gain in "Changes in Diet and Lifestyle and Long-Term Weight Gain in Women and Men" might have been very different.